Congratulations to Mike Kachan who has come out on top of a field of 2,525 on his way to winning a WSOP gold bracelet and a huge payday of $403,483. Sixteen players returned today and they got off to a fast start. In short order the tournament lost Michael Spegal (16th), Robert Merulla (15th), Justin Schwartz (14th), Daniel Riley (13th) and Michael Marckx (12th )in the first two levels and Bastian Fischer finished in eleventh soon after. The two tables then merged to an unofficial table of ten before Matt Salsberg shoved with on a flop of into the of Raymond Henson and his gutter ball didn’t arrive sending Salsberg home in tenth. From the very first level of the tournament two days ago the action was fast and furious but as soon as the final table of nine was formed it was anything but. From then on it was the story of an extraordinary sequence of double ups as the short stacks came back from the dead time and time again, and a raise would often lead to the blinds and antes being won. Stacks were mostly evenly distributed, and never very deep, so multi-street action was few and far between. No player wanted or could afford to make a mistake, and if they did it seemed as if a double up wasn’t that far away. One by one though they were eventually eliminated. Ray Henson called a shove with a nut flush draw but couldn’t get there so was gone in ninth. Richard Milne fell eighth with a shove from the button running into Egan’s small blind . Seventh place went to Steve Gross when he picked up a losing pair of pocket fives for the second hand in a row and shoved them into Jeff Blenkarn’s tens to end his participation. Neo Hoang was sixth when his three-bet shove with was eventually called by the of Viktor Skoldstedt. 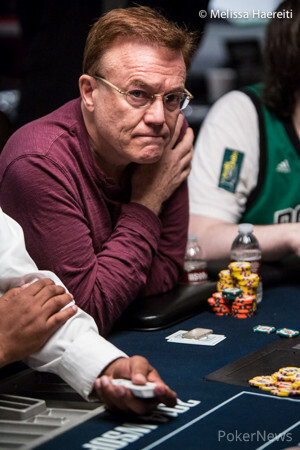 It then took nearly two more hours before Viktor Skoldstedt was felted when he picked what looked like a good three-bet shove spot with but Jeff Blenkarn was going nowhere with his and Skoldstedt had to be satisfied with fifth and $93,940. More swapping of chips followed until Andrew Egan got short and his move with the was picked off by Mike Kachan with . Egan left in fourth with $128,032 having come back from a short stack several times. Three handed play began with fairly even stacks again but the pace picked up considerably as players seemingly opened up their ranges. A shove from Eric Shanks with a strong three handed was unlucky to run into the of Blenkarn who claimed another victim and sent Shanks out in third to collect his $177,527 winnings. Heads up play would last just fourteen hands as both players refused to back down and when Kachan turned two pair in position he instantly called the shove of second place finisher Blenkarn and held on for the win. Blenkarn desperately wanted that bracelet but had to console himself with second place prize $ 250,815. A tumultuous and gruelling three days play had finally come to an end in the early hours of Wednesday morning as a delighted Kachan celebrated with friends and basked in the attention of the media. He held up the gold bracelet as the winners photographs were taken, promising to put in on the wrist of his baby as soon as he could. 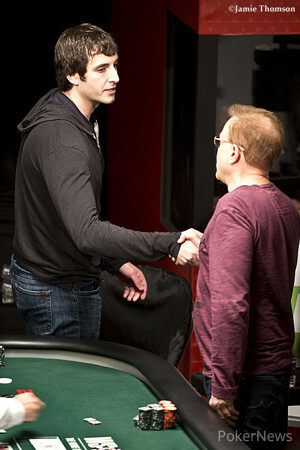 Mike Kachan opened for 250,000 and Jeff Blenkarn thought for a while before calling and checking in the dark. Mike Kachan bet 215,000 and Blenkarn raised him to 615,000. Kachan made the call. The turn was the and Blenkarn moved all in. Kachan couldn’t have called any quicker and the cards were turned over. Blenkarn had but Kachan held the for two pair. The river was the and Kachan shook the defeated Blenkarn’s hand before celebrating with his cheering rail. Hand #183: Mike Kachan limped and Jeff Blenkarn checked. The flop was . A bet of 150,000 from Kacham took it down. Hand #184: Blenkarn raised to 240,000, Kachan made it 510,000 and Blenkarn moved all in. Kachan laid it down. Hand #185: Kachan opened to 300,000 and Blenkarn moved all in. Kachan folded. Hand #186: Blenkarn opened to 240,000 and Kachan called. The flop was and a 125,000 bet from Kachan was called. The turn was the and Kachan fired again for 175,000. The river was the . Kachan checked and Blenkarn showed and the of Kachan was good for the one pair on the river. 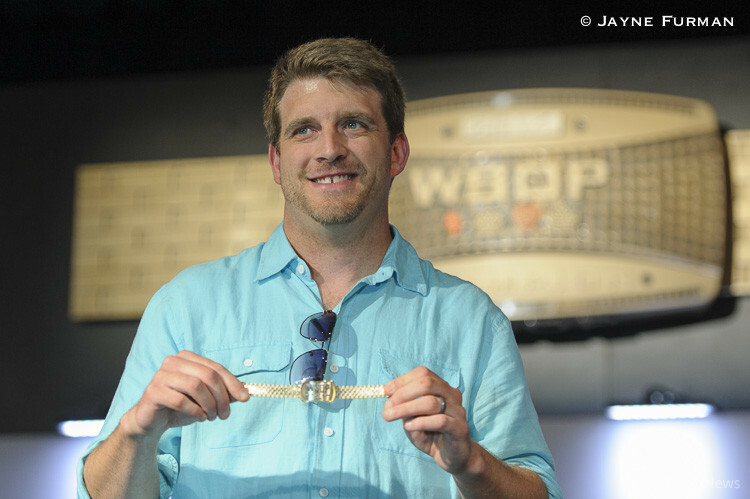 Hand #178: Jeff Blenkarn raised to 360,000 and won the pot. Hand #179: Mike Kachan raised to 240,000 and Blenkarn called. On the flop, Blenkarn bet 325,000 and Kachan quickly grabbed into his stack, making the call. Blenkarn checked the turn and Kachan bet 275,000. Both opponents stared at each other and Blenkarn folded after about one minute of consideration. Hand #180: Blenkarn announced a raise and made it 240,000 to go, Kachan called. Kachan checked the flop, Blenkarn quickly bet 400,000 and his opponent already placed the chips for the call while it was announced. The turn was checked through and Kachan announced 395,000 only moments after the completed the board. Blenkarn quickly called with but that was only second best to the of Kachan. Hand #181: Blenkarn got a walk. Hand #182: Kachan also received a walk. While checking out the WSOP coverage here at PokerNews, why not grab a free €10 - with no deposit required - and get in on some action online? You can try your luck with €10 in tournament tokens on Titan Poker’s amazing software absolutely for free just by creating your Titan Poker account through our links. Click here to read more about the offer. 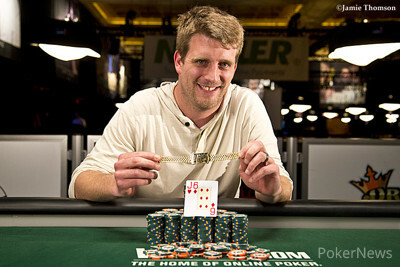 Hand #173: Mike Kachan made it 235,000 on the button and Jeff Blenkarn called. The flop was . They both checked and the turn was the . Kachan bet 255,000 and Blenkarn called. The river was the and Blenkarn led out for 220,000 and took it down. Hand #174: Kachan got a walk. Hand #175: Blenkarn got a walk. Hand #176: Blenkarn opened for 250,000 and Kacham called. The flop was which was checked. The turn was the and Kacham bet 105,000. Blenkarn considered and called. The river was the . Blenkarn won with . Hand # 177: Blenkarn got a walk. Hand #172: Eric Shanks moved all in from the button and Jeff Blenkarn did so as well, Mike Kachan quickly folded his cards. Shanks was the player at risk and he also had the worse hand preflop. The flop only improved his hand slightly and the turn brought no change. With the as final community card, Shanks was eliminated in 3rd place and there will be a short break to re-seat the players.